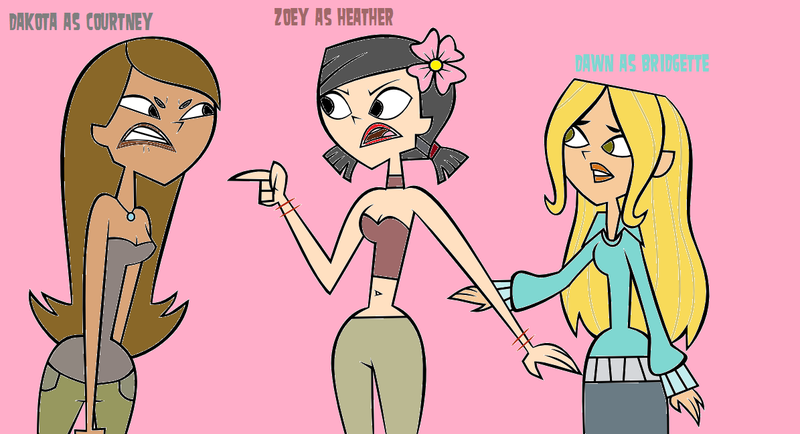 Courtney (Dakota), Heather (Zoey) and Bridge (Dawn). At least I gave credit on DA.. HD Wallpaper and background images in the আমাদের নাটকের মঞ্চ club tagged: total drama island courtney dakota zoey heather dawn bridgette. This আমাদের নাটকের মঞ্চ fan art contains নকল মানুষের, কমিক বই, কমিকস, and কার্টুন. BTW Way to go Heather!!!! I knew Zoey was the New Heather since she took down Scott in a similar way of Heather in the TDWT Finale towards Alejandro. dawn's pretty!! is she from the new series?? The funny thing is they all look like them. Turns out, FANG got Scott in the robot suit. Not Zoey. ^ yeah it was fang. Zoey just beat him up and got him voted off. ^ exactly. And Dakota is NOTHING like Courtney. ^ yeah. She's kinda like Lindsay. I dont get why everyone compares her to Courtney and Heather. Ooh, looks like there's a catfight going on in this scene! Their personalities don't match,but their looks do. 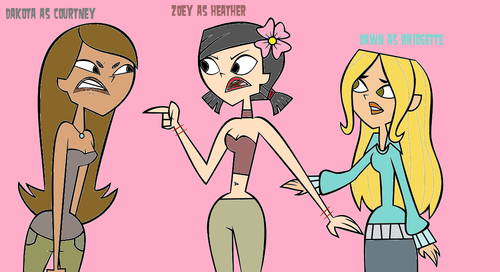 ^Dawn makes an exception since Bridgette is kind, and Gwen is evil. @DandC4evacute How is Dakota NOTHING like Courtney, despite what the promotional picture of Anne Maria and her bickering, similar to Lindsay (Anne Maria) and Courtney (Dakota) showed. ^ For one thing, Dakota didn't even care about winning.